Reading this on the http://linuxoniphone.blogspot.com just made my day.Steve Jobs must be thoroughly annoyed. First the unlocking and now this. Life we just be much easier if the iPhone was opened up. I’m pleased to announce that the Linux 2.6 kernel has been ported to Apple’s iPhone platform, with support for the first and second generation iPhones as well as the first generation iPod touch. This is a rough first draft of the port, and many drivers are still missing, but it’s enough that a real alternative operating system is running on the iPhone. The current userland we’re using, in the interest of expedience, is a Busybox installation created with buildroot, but glibc works fine as well, and we’re going to build a more permanent userland solution. Author Peter SkarpetisPosted on November 29, 2008 November 29, 2008 Categories LinuxTags iPhoneLeave a comment on Linux on the iPhone! 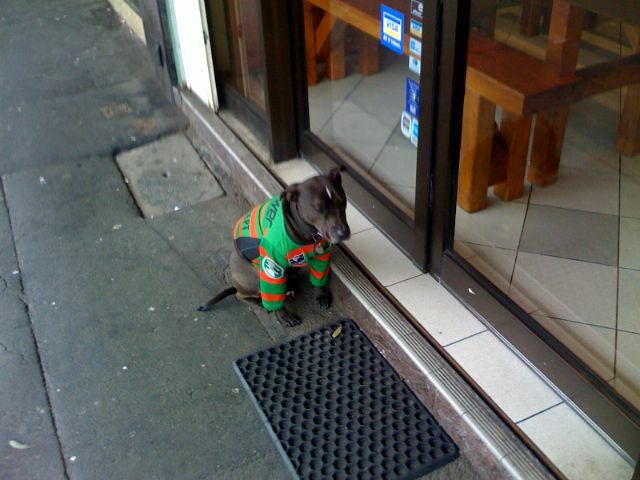 I saw this unhappy dog wearing a South’s jersey today while getting some lunch. I guess he was unhappy because of South’s abysmal performance.